Bacon Wrapped Hot Dogs are my recipe contribution to 4th of July celebrations. Even though I’m in Australia, I’ll be having a BBQ to celebrate! It doesn’t take much for me to get enthused about get togethers with my fabulous friends. Even last Friday when I was out with the girls and we were talking about our annual Christmas party (yes – 6 months out), I instantly raised my hand and chirped “I’ll do the food!”. 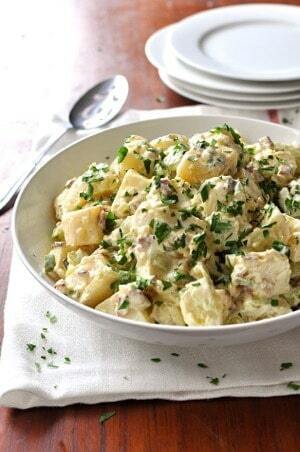 Mrs Brodie’s famous Potato Salad will be making an appearance at my 4th of July BBQ! 4th of July is one such get together. Born in Japan, raised in Australia, I’ve travelled throughout the US a handful of times and have very fond memories. From NYC to Washington, Miami to LA, San Fran, Texas and New Orleans, I had so so much fun (and food) everywhere I visited. So I’ve celebrated 4th of July almost every year since I first visited the US and this year is no exception. It is actually winter in Sydney, but our winter is very mild. We will grill outdoors and I’ll be making hot dogs, ribs, potato salad, corn on the cob and I guess I have to provide a green salad too. 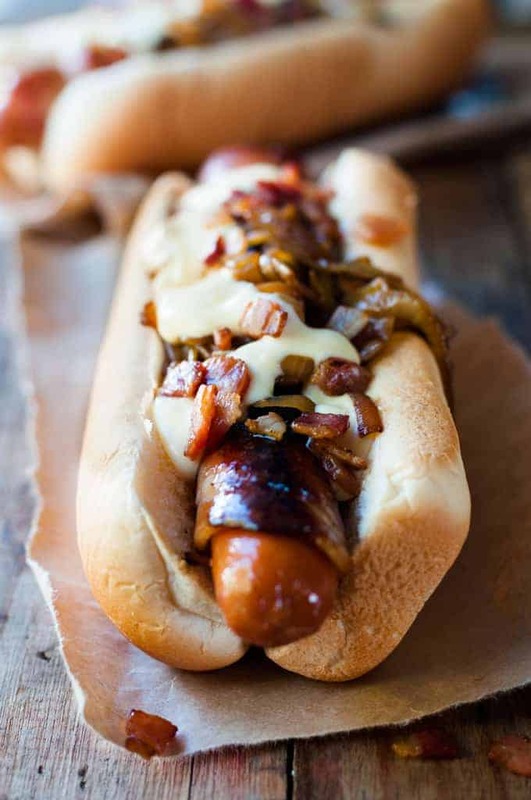 Not just any old hot dogs though – these Bacon Wrapped Hot Dogs! Smothered with the most awesome ever cheese sauce (that stays gorgeously creamy even when it’s cool and it’s NOT made with plastic cheese!). Oh! Before I forget – few photos of how to roll the hot dogs up in bacon. 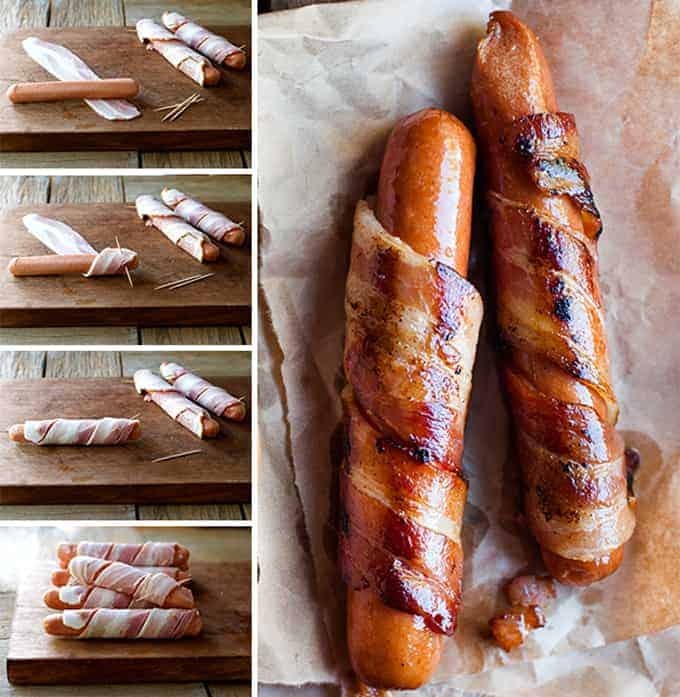 Super simple – just place the hot dog on the bacon on an angle, then roll it and secure the top and bottom with toothpicks that have been soaked in water. If you are cooking them on the outdoor grill, then the toothpicks won’t get in the way of browning the bacon all over because they kind of poke down in between the slats. In reality, I dollop a LOT more cheese sauce on these hot dogs. If I used as much as I normally do, you wouldn’t be able to see anything else – including (probably) the bun!!! So for the purposes of the photos only, I used restraint. Extreme restraint. PS You know what happened two seconds after I snapped the photo, don’t you? Yes, I grabbed one of those hot dogs, piled on more cheese sauce. And grinned happily as I savoured every single bite. Can’t wait to make these for my friends next weekend!! Anything Bacon Wrapped is a GOOD THING! One Pan Ricotta Stuffed Prosciutto Wrapped Chicken WITH Scalloped Potatoes! 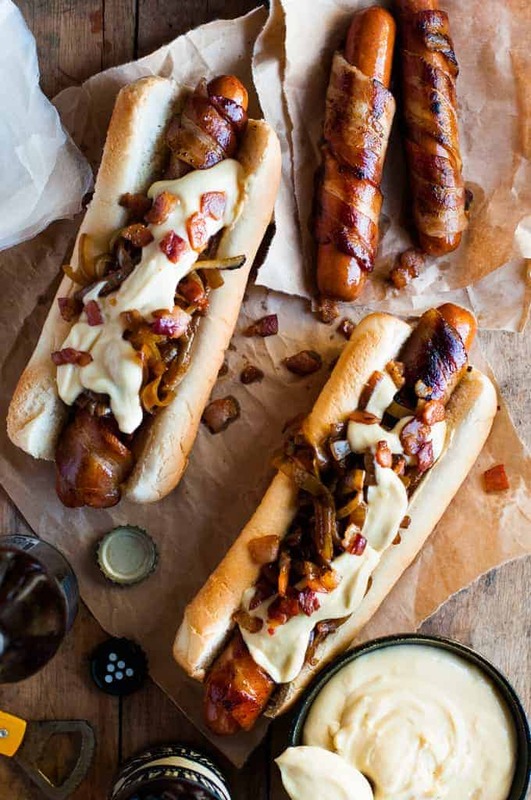 Full loaded hot dogs with bacon wrapped hot dogs, onions and smothered with a fantastic cheese sauce that stays creamy even at room temperature. This recipe makes more cheese sauce than you will probably need but it's better to be safe than sorry. Use leftovers as dip! Toss together the cheese and cornstarch in a small saucepan. Add the remaining ingredients EXCEPT the milk and cook over medium heat, whisking occasionally for the first couple of minutes then frequently as the cheese melts. Whisk until the Cheese Sauce is smooth (about 5 minutes). Remove from the stove and let it cool to room temperature. 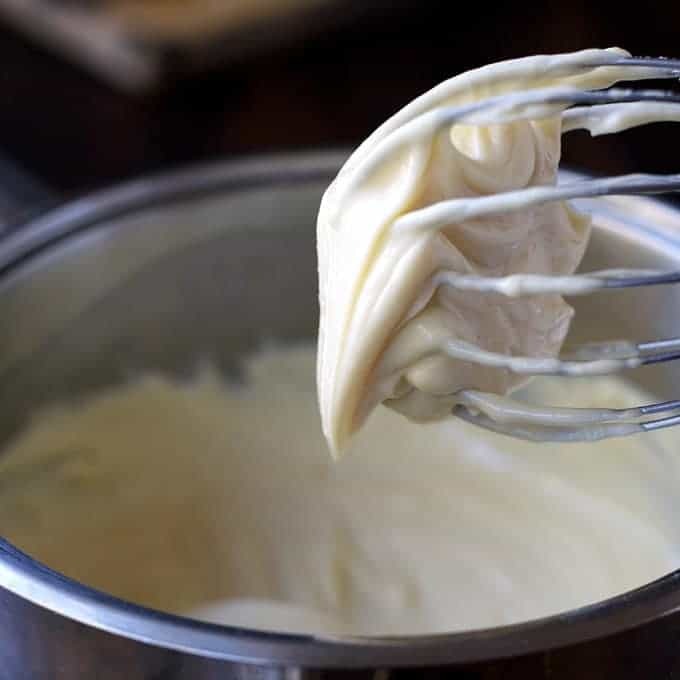 Whisk vigorously every 5 minutes or so to blend the "skin" that forms on the surface into the Cheese Sauce. Once it is at room temperature, use the milk to make the consistency suitable for dolloping onto the hot dogs. Trim the edges of the bacon so they wrap neatly without overlapping. Brush the grill side with oil and drizzle the remaining oil on the flat iron side of the BBQ. Then heat on medium high (or do this in a frypan over medium high on the stove). On the flat iron side, add the onion and cook until dark golden brown. Cook the extra Bacon for Garnish at the same time (if using). On the grill side, cook the hot dogs, turning until nicely browned all over. Partially cut the hot dog buns. 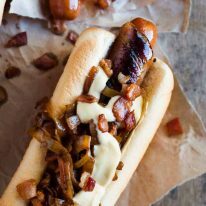 Place a bacon wrapped hot dog in the bun, top with onion, a generous amount of Cheese Sauce and Bacon for Garnish (if using). 1. For fellow Aussies, you can get American style hot dogs in the refrigerator section of Coles and Woolworths. Or at some butchers. 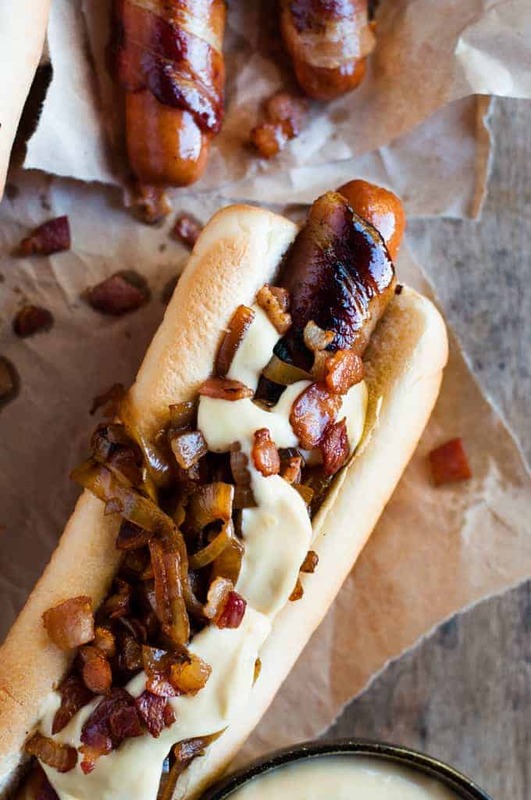 If you can't find American style, any other hot dogs will do just fine as long as they are suitable for cooking on the BBQ/stove. 2. You should not need to trim the toothpicks if you are cooking them on the grill side of the BBQ as I find that the toothpicks poke through the grill so it's easy to brown them all over. It's not possible to do it in a frypan which is why the toothpicks need to be trimmed. 4. 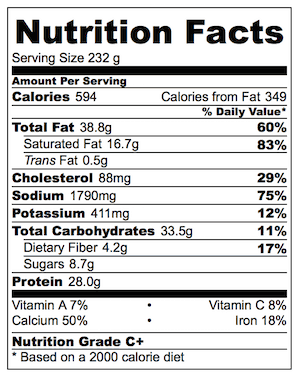 Nutrition per hot dog assuming 2/3 of the cheese sauce is used (because the recipe makes more than required). I have been searching for a noteworthy beer cheese recipe for a week now and this recipe for the cheese sauce has THE perfect consistency. Do you think adding beer would ruin it? Is there some modifications to the ingredients that would have to happen in order to make it work?